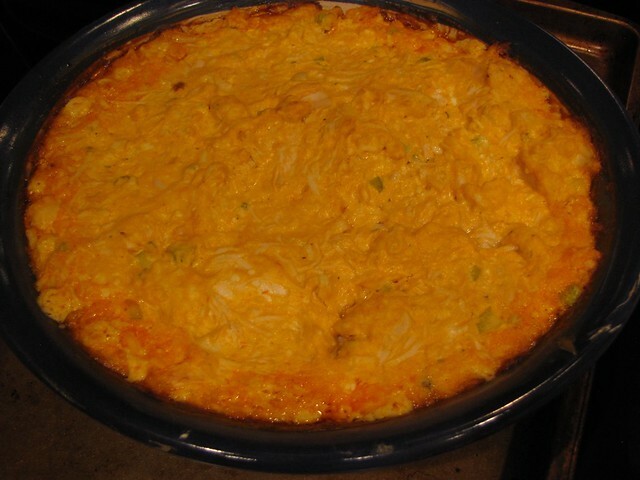 The Best Buffalo Chicken Dip. Just in time for the Superbowl or any serious snacking occasion. Or even dinner…because once you have this warm, gooey dip sitting on your counter, you’re going to want to eat it all instead of cooking what you had planned for dinner. This recipe comes courtesy of my neighbor Jody. She made this for a little get together and we all snarfed it down like it was going out of style. It’s spicy, cheesy, chickeny – completely addictive. 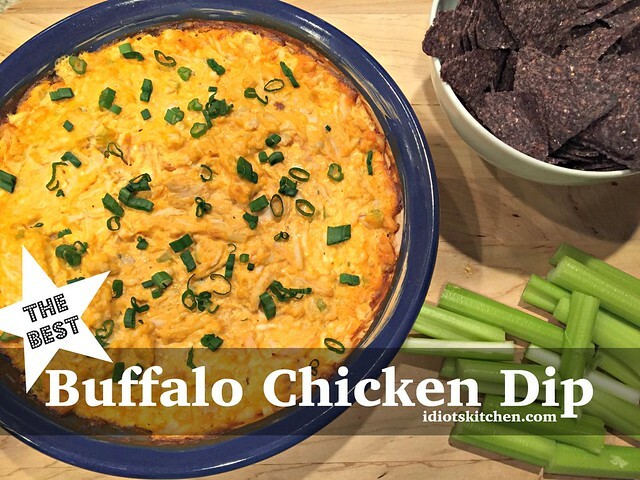 Once you’ve tasted it, I’m sure you’ll agree that it is The Best Buffalo Chicken Dip in the history of dips! As a bonus, it’s super easy to prepare. 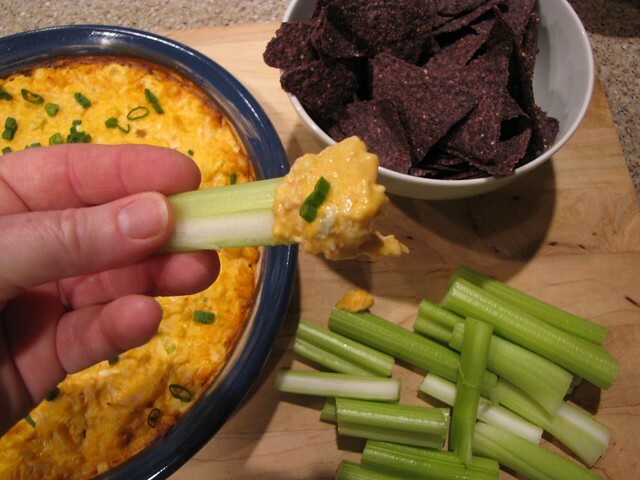 You’ll also want some sturdy corn chips or crackers and some crunchy celery stalks for dipping. 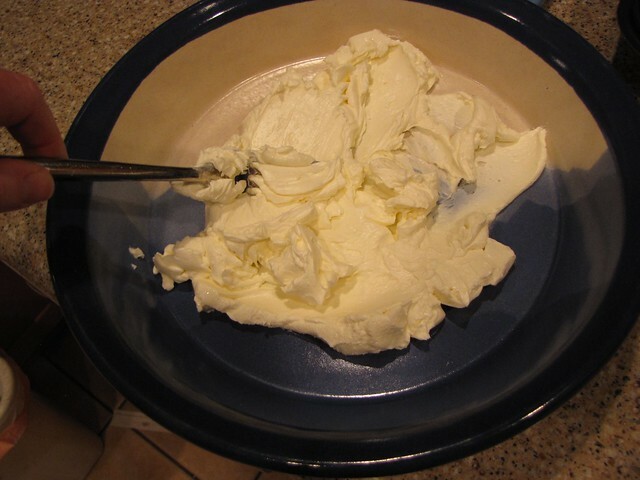 This recipe needs softened, room temperature cream cheese so plop an 8 oz. block out on the counter a few hours before you plan to eat. Place your softened cream cheese in a 9-inch, deep dish pie plate. You could also use any similar sized casserole dish. 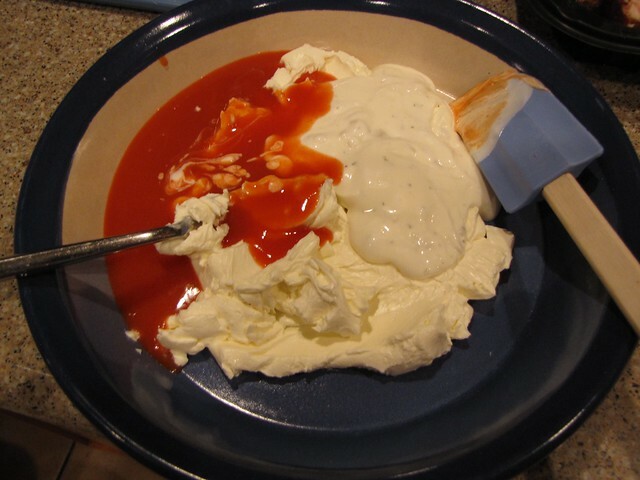 Stir (or smoosh) the cream cheese with a fork until smooth. 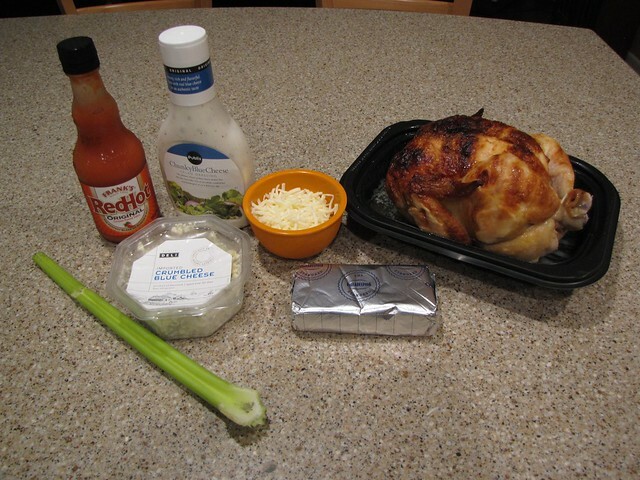 Add ½ cup blue cheese salad dressing and ½ cup hot sauce. I like Frank’s or Texas Pete but you can use any hot sauce you like. 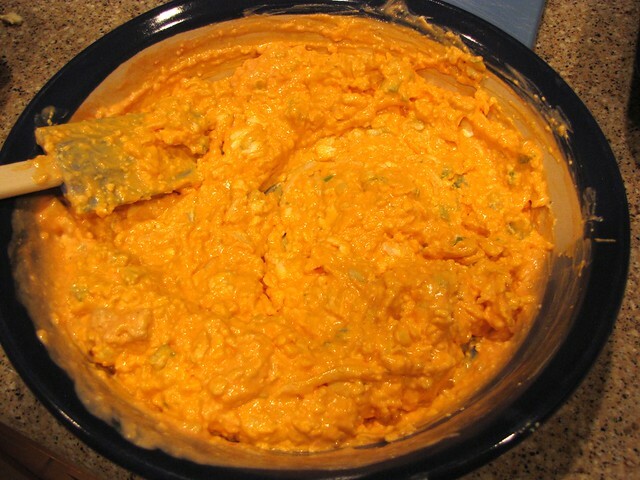 And yes, a half cup of hot sauce gives this Buffalo Chicken Dip a nice little kick but it’s not so spicy that it burns your face. Give everything a quick stir to combine all of the liquids. 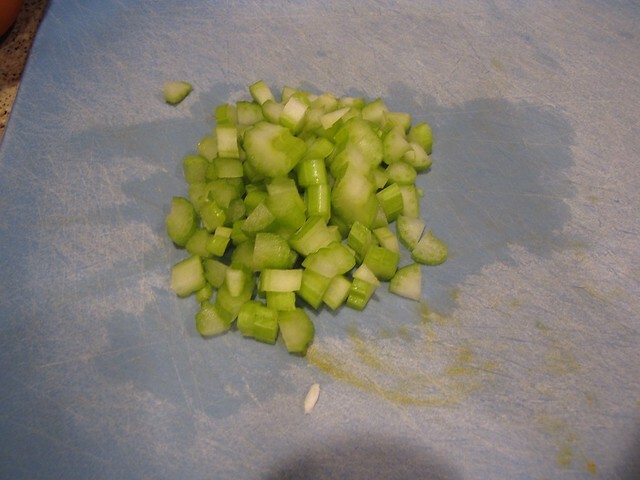 Finely chop 1 rib of celery – about ½ cup. 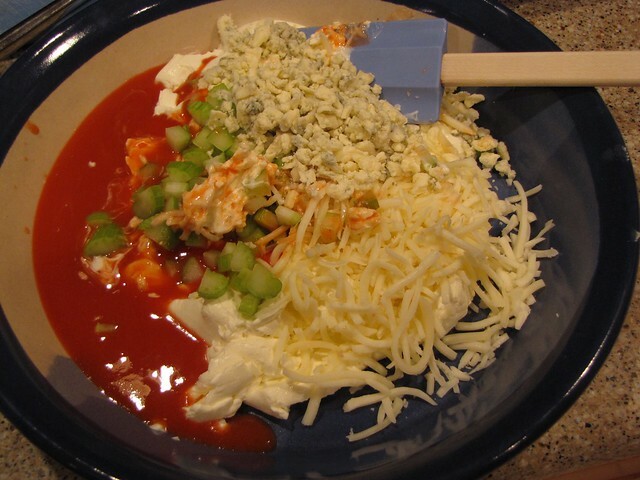 Add the chopped celery, ½ cup of blue cheese crumbles, ½ cup of shredded mozzarella cheese and stir the ingredients together. You could cook a couple chicken breasts in the oven for this but a much easier way is to buy a prepared rotisserie chicken at the store. I used mostly white or breast meat and shredded it with my fingers. 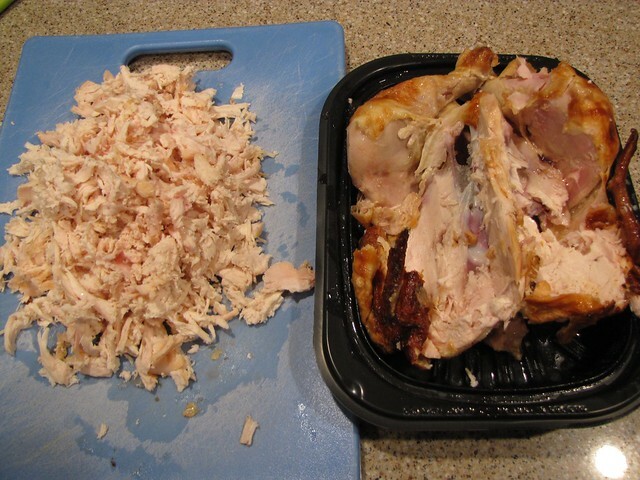 You’ll want about 3-4 cups of shredded chicken so depending on the size of your bird, you might also have some extra chicken leftover. Add the shredded chicken to the dip and stir until smooth and well combined. You can opt to add more chicken if you’d like. One of the things that makes this dip so hearty is that it is packed with chicken…and cheese. Bake at 350° for 20-25 minutes or until hot and bubbling. I added a few chopped green onions for a garnish. You could also use parsley or cilantro or just skip the garnish and start dipping! I have some blue corn chips but my dipper of choice is a super crisp celery stick. Who needs football when you have dip this good?